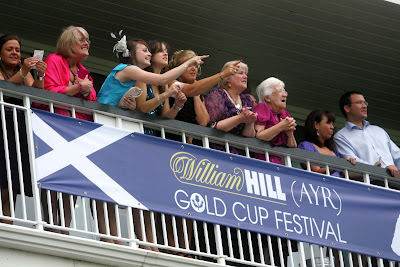 SUN and fun – just two of the ingredients that combined to make the 2009 William Hill (Ayr) Gold Cup Festival at Ayr Racecourse one of the best in living memory. One lady who certainly had an unforgettable experience at the track was London girl Alex Wilson. Marketing manager of Investec, who were sponsoring a race on Friday, Alex landed a bronze coin as one of the Best Dressed Ladies and went on to draw the winning horse in the William Hill (Ayr) Bronze Cup – Baldemar. A stunned and delighted Alex was presented with her prize - a fabulous Vauxhall Tigra Rouge Special Edition - by Jim Smith, managing director of sponsors Kerr & Smith and Iveco Trucks. Runner-up was Nicola Healy of Kilmarnock, who won a seven-night cruise courtesy of Stewart Travel and Fred Olsen. Third prize went to Mauchline woman Jillian Wyllie – a piece of jewellery from Alex Cairncross and a spa package for two from Purity Spa at Lochgreen House. Jim Smith said: “This is our second year of sponsorship, and it has been a great occasion once again. 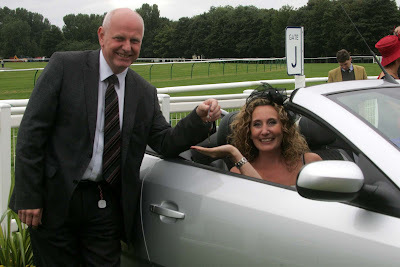 I’m delighted that Alex has won the car – it’s the very last one in the UK, and is a real collectors piece. Slater Menswear sponsored the Best Dressed Gent competition, and this was won by Scott Stimson of Ayr who was presented with £300 of Slater vouchers from Ayr Slater Menswear manager Jack Blades. Around £2 million was pumped into the local economy, with hotel rooms within a 15 mile radius sold out and bars, restaurants and taxi firms also benefiting. There are currently 583 Ayrshire business stories permanently archived on this site. To locate those of most interest to you, please use the site search facility in the top left hand corner of this page. Type your search term in the white box, then click “SEARCH BLOG”.